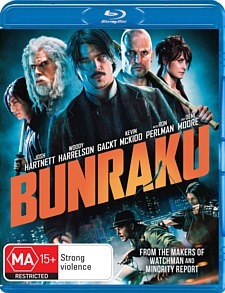 Bunraku Blu-ray Review. Director Guy Moshe, whose previous film was the affecting and beautifully shot debut Holly (2007), seems to be out of his depth in the hyperreal milieu so comfortably inhabited by Tarantino, Edgar Wright, Takeshi Miike and their ilk, clumsily throwing in everything but the kitchen sink in an attempt to appear hip and edgy. If imitation be the sincerest form of flattery, the makers of films such as Sukiyaki Western Django, Kung Fu Hustle, The Good, The Bad, The Weird and Scott Pilgrim vs The World must be feeling very flattered indeed by the 118 minutes of fulsome praise for their work that is Bunraku. Set in a post-apocalyptic world were bombs and firearms have been outlawed in an attempt to curb man’s supposedly limitless capacity for wanton self-destruction, the film sees a nameless drifter (Josh Harnett) drift his way into an urban hellhole terrorised by the interestingly-named villain Nicola the Woodcutter (Hellboy’s Ron Perlman). After indulging in a bit of chit chat with a sassy barkeep (Woody Harrelson), the drifter joins forces with a Japanese swordsman in an attempt to bring down the nefarious Nicola and his cronies. A shameless amalgam of filmic parlour tricks that have been done better elsewhere by vastly more experienced magicians of the screen, Bunraku is so achingly self-conscious that it destroys any chance the viewer has to become immersed in its technicolour pastiche of comic book sensibilities. Director Guy Moshe, whose previous film was the affecting and beautifully shot debut Holly (2007), seems to be out of his depth in the hyperreal milieu so comfortably inhabited by Tarantino, Edgar Wright, Takeshi Miike and their ilk, clumsily throwing in everything but the kitchen sink in an attempt to appear hip and edgy. There’s nothing arch in Moshe’s nods to his predecessors, however, and for a film so brimming with visual splendour and computer generated trickery the end result is curiously colourless. It’s also nowhere near as self-aware or sophisticated as it thinks it is; most worryingly, though, it simply isn’t much fun. None, unless you count the trailers that take forever to load and have to be skipped through individually before the main menu can be accessed. This is annoying I’m actually going to have to award a negative score for bonus features in this instance.